Time is gold – that’s a fact. We are always pressed for time with too many things to do and with too little time. This causes us to be stressed out as we try to cope and finish what we have to do for the day. We tend to envy people who can always take their time. Is it because they have a few things to do? Could it be that they have more than what they need that they don’t really have to rush things? Let me tell you this – life could be a lot easier if you learn the art of sound time management. Set your priorities and be sure to stick to them. Important things should be finished first. Many people tend to choose easier things to do initially which makes them cram when there is too little time left for important tasks to be done. They are bound to fail – not having enough energy and with sloping attentiveness to complete important matters within a limited time. Make a list of all the things that you need to do for the day. Sort these out and make a mental schedule of what you need to do first. Schedule trips based on geographical locations in such a way that you can cover them all in one go within the day. 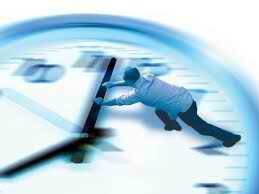 Time can easily be wasted by travelling back and forth without a strategic plan. Do not stick to any one task for so long. This will only lead to boredom which is a waste of time. Split tasks into sections and achieve a section at a time. This will make difficult tasks much easier and more manageable. It further maximizes your time and makes you achieve important tasks much easier and faster. At the beginning of the day, review your priorities well. This will remind you on what to do first. This maximizes your opportunity to meet all your objectives especially the most important ones within the needed time frame. Do not panic. Teach yourself to relax with some breathing exercises and self-motivation by thinking positively about beautiful things. Panicking will only make you prone to making mistakes. It will also stress you out a lot – draining you of the much needed energy to finish the entire tasks you’ve laid for the day. Stay inspired. Always remember your goals when doing things. It could be a good future for your family, a house that you hope to acquire or a dream car that you want to reward yourself with. These will keep you motivated and inspired in doing your tasks especially the difficult ones. Keeping the above guidelines in mind, will make you achieve all the tasks that need to be done. Twenty-four hours is such a long time to be able to achieve a lot of things if you learn sound time management skills. Also bear in mind that our body needs some relaxation. Never deprive yourself with this essential pleasure. Do not skip lunch breaks to save time. You can shorten it but do not punish your body by making it starve. You can’t achieve excellent things when you are weak. This will also make you too lazy to nurture relationships – so practice time management at all times.